DVI has Aircraft Cockpit Design Experts that understand the limitations of cockpit warnings and how the design of warning systems can be related to an aircraft accident. Our Flight Deck Warning Experts know that the successful and safe operation of an aircraft requires the monitoring, interpretation and integration of multiple streams of information. The three fundamental principles of a flight deck warning system include 1) alerting the crew and a call for their attention, 2) report the nature of the condition, and 3) guide them to an appropriate corrective action. In general, alerts and warnings can be visual, aural, or tactual in nature. There are also a number of Human Factor considerations that need to be considered when evaluating a pilot’s response to a cockpit warning or alert. For example, the warning system must be highly reliably because the credibility of the warning will be greatly diminished if the crew comes to expect false warnings. This also includes the excessive appearance of an alerting signal, because it will reduce the pilot’s response to it. When an accident does occur DVI's Aircraft Cockpit Experts can assist in evaluatimg the warning and alerting sytem installed in the accident aircraft. 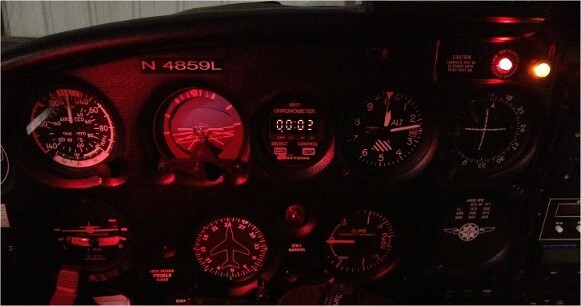 With an actual vacuum pump failure, the attitude indicator and heading indicator will not instantly show a failure, such as when the instructor places a suction cup over the instrument. This difference in identifying the failure is significant, even for seasoned pilots. Many times, by the time the pilot identifies the failure of the attitude indicator, the aircraft is already in or entering an unusual attitude. Accident data indicates that when this happens pilots may not have the proficiency to safely recover and land the airplane, even though instrument-rated pilots receive partial panel training. One reason for this is that most pilots tend to rely heavily on the attitude indicator in IMC to maintain aircraft control. Most small general aviation airplanes typically have an attitude and heading indicator powered by a single vacuum source. These airplanes normally do not have redundant vacuum systems or a second attitude indicator. Therefore, to recognize that a failure condition exists and isolate which instrument has failed, the pilot must cross-check other instruments that indicate pitch or bank information. Loss of aircraft control can occur: (1) When the pilot does not recognize that a failure condition exists and continues following erroneous instrument indications, (2) During the time it takes the pilot to determine which system has failed, or (3) During subsequent partial panel instrument flying, which can be confusing if the pilot cannot cover the failed instrument(s).